BUMPER Dent Repair! USE This Amazing TRICK and Your Father Won’t Get MAD! - Muscle Cars Zone! BUMPER Dent Repair! USE This Amazing TRICK and Your Father Won’t Get MAD! Having an upsetting experience with a parking lot pole can easily make you stressful for lots of reasons. First of all, your car will look terrible and second you will have to spend days and days to find the right mechanic that will return the old, original look of your beauty. And that costs a fortune. 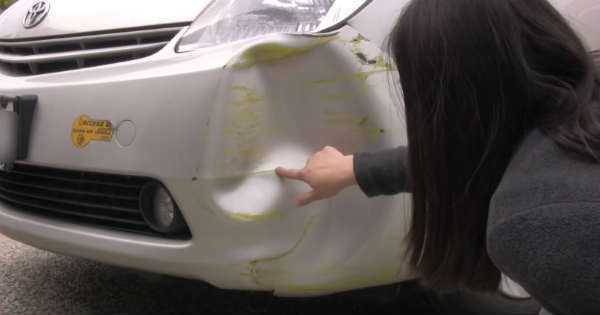 Luckily we have the solution for you and instead of paying an extra expensive expert you can watch this do-it-yourself bumper dent repair tutorial that will save you money and time. In the example shown in the video, the family does a Toyota Prius` bumper replacement and believe me, you will be positively shocked by the results that they will achieve with just a little effort. At first, this bumper dent repair looked like mission impossible. As a matter of fact, it was, when these people were using only one hair dryer. However, later on they found out that they need more heat. FYI, the heat makes things expand and when expanding the intermolecular space becomes larger tearing the molecules further away from themselves and thus allowing the bumper to look as it should with just a small amount of force. OK now, the science class is over. Armed with only a solvent, 2 hair dryers and some paint, this funny Japanese family does a magnificent work with its vehicle, that at the end looks way better than a big dent! This trick that costs nothing can be easily used on lots of vehicles` areas that are plastic. If for example, your car has a metal body in the area where the dent is or if you cannot easily access the other side of the dent, then this method is probably not the right one for you. Still wondering how to fix car dents? Here is another useful tutorial!